We provide professional attic insulation solutions to clients in Midland, Odessa, Big Spring, and all surrounding suburbs. Proper attic insulation can dramatically reduce heating and cooling costs, reduce wear and tear on your roof, prolong the life of heating and cooling systems while increasing living space comfort. According to Energy Star, 90% of American homes are under-insulated. This means that 9 out of 10 U.S. homeowners are wasting money on their energy bill. According to the Department of Energy, heating and cooling account for 50 to 70% of the energy used in the average American home. 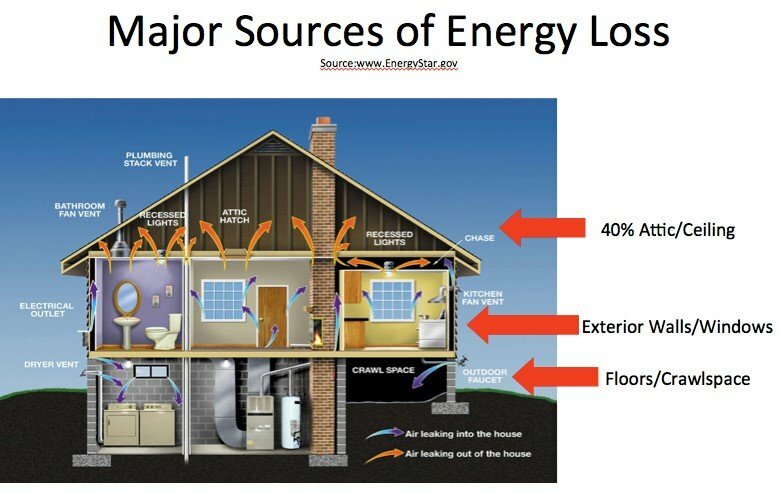 Inadequate insulation and air leaks are the leading causes of energy waste in most homes. Take action today, to stop wasting energy, save money, and increase your home’s comfort. Heated air naturally flows into cooler space. Attic insulation creates thermal resistance, slowing down the rate at which heat flows from warm areas to cooler areas in your home. In winter, your insulation slows heat from flowing into your attic from the living areas below, reducing the amount of time you will have to run your heating system in order to maintain your room temperatures at a comfortable level. In summer, insulation prevents heat built up in the attic from penetrating down into air-conditioned living spaces below, which also cuts costs while reducing wear and tear on your air conditioner. If you have rooms that heat slowly in winter or cool slowly in summer, you may have insufficient or uneven insulation levels in your attic. Take action today to stop wasting energy, save money, and increase your home’s comfort. NOT SURE IF YOUR ATTIC IS PROPERLY INSULATED?